Our range of Server Racks have been designed specifically to house all industry standard servers with an overall external depth of 1000mm. Increased airflow allows all equipment inside to remain cool. These Racks include all the features you need and expect like lockable and removable doors and 19" mounting profiles front and rear. RackyRax Server Racks & Cabinets have been designed to offer the optimum housing for servers and networking hardware from all the leading manufacturers including Dell, HP and Netgear. Mesh front and rear doors plus a vented roof add up to offer maximum ventilation. 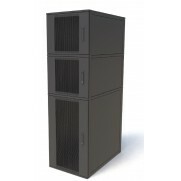 Server Racks come in a range of heights to suit your requirement, from 12U up to 47U. The cabinets are fitted with quick release front and rear perforated doors (approximately 60% open), fitted with lockable swing handles. The side panels can be fitted with cabinet locks. The large floor aperture gives maximum cable access, plus there is cabling access in the top. All apertures are fitted with blanking plates as standard. These server racks have additional cable access next to the profiles to allow easy routing of cables from the front to the rear of the cabinet. Our server racks are available in various configurations and are supplied fully assembled on a pallet, but all cabinets can be easily dismantled if required. The high quality attractive black finish ensures the cabinet will complement high specification office environments. A full range of server rack accessories can be found by clicking here. Possible 2-3 Day Lead Time.